These are our favourite things to do in New York City at Christmas. It doesn't matter what time of year that we visit New York City, the first thing that we do is head to Rockefeller Plaza. The seasonal displays in the Channel Gardens are beautiful any time of the year but the Christmas installation is my favourite and a holiday trip to NYC wouldn't be complete without checking out the famous Rockefeller Christmas Tree and the skaters on the iconic rink. The area around Rockefeller Plaza is generally very crowded so try to get an early start for better photo opportunities but be sure to stop by in the evening at some point as well because the tree is stunning when it's lit up. Skating outdoors is an important part of a holiday trip to New York for many visitors. The best-known skating rink is the one at Rockefeller Plaza but did you know that there are less busy rinks in midtown Manhattan? Just a few blocks south of the Rockefeller Center, you can rent skates and hit the ice at the Bryant Park rink (5th Avenue and 42nd Street) which is the only free admission ice skating rink in New York City. Central Park's Wollman Rink (around 5th Avenue and 59th Street) is another popular outdoor skating venue and while there is a fee to skate at this rink, it is less expensive than the Rockefeller Center rink. If your trip wouldn't be complete without skating at the Rockefeller Rink then be prepared to wait up to an hour outdoors or you can pay for the VIP experience to avoid waiting in the general admission queue. Chances are that if you have ever watched Miracle on 34th Street, you have thought about meeting the "real Santa" at Macy's flagship department store. We have always visited New York between Christmas and New Year's so never had an opportunity to meet the Macy's Santa Claus when our girls were young and a part of me regrets that just a bit. If you do have an opportunity to be in New York between the U.S. Thanksgiving holiday and Christmas Eve then make a point of taking your children to Macy's Santaland (advance reservations are required in order to minimize the waiting time to see Santa). The over-sized Christmas ornaments on 6th Avenue (Avenue of the Americas) are one of my favourite attractions in NYC during the holidays - you can't help but smile when you see these giant decorations!! While you are in the neighbourhood, pop into Magnolia Bakery at the corner of 49th Street and 6th Avenue for a treat. There might be a line-up but it's worth the queue for their delectable cupcakes. We particularly liked the Christmas Rockettes cupcakes that were on sale last year. I resisted the temptation, but apparently they were delicious!! A holiday lights tour is the perfect way to get you in the spirit of the season in New York. One of the city's most popular tours is the Dyker Heights Christmas Lights Bus Tour offered by A Slice of Brooklyn Bus Tours which visits the Dyker Heights neighbourhood of Brooklyn to see the extravagant light displays. This tour always sells out so be sure to reserve your spot early. We tried to book it prior to our visit last year and were out of luck because I had waited too long. 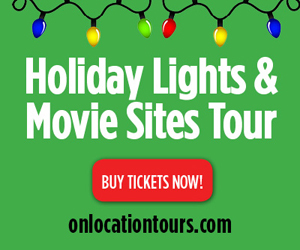 If you're also a movie fan then you might enjoy On Location Tours' Holiday Lights & Movie Sights Tour which which will take you to the filming locations of your favourite holiday movies set in New York. More than 10 years ago, we saw a touring version of the Radio City Rockettes' Christmas Spectacular in Toronto and from that moment I wanted to see the show in New York. I finally had the opportunity when we visited New York City between Christmas and New Year's last year and attended one of the performances at Radio City Music Hall - on my birthday which was the best present! The iconic Radio City Rockettes are a world-famous precision dance company that was originally formed almost a century ago. The high-kicking Rockettes have been starring in the Radio City Music Hall's Christmas show since it was first staged in 1933. The show is a beloved holiday tradition popular with both visitors to the city as well as New Yorkers and is attended by over 1 million people annually. Each year's version of the Christmas Spectacular adds a little something new as well as presenting all of the traditional favourites including the Living Nativity, Parade of the Wooden Soldiers, Rag Doll and New York at Christmas. Attending a performance of the show is the perfect way to get into the holiday spirit in New York City! Run time for the Christmas Spectacular is 90 minutes with no intermission (ideal for families with young children with shorter attention spans) and it's performed several times a day during the holiday season so it's easy to fit into your itinerary. We attended a late morning performance so that we would still be able to fit in another Broadway show later that day. FYI - there's no longer a touring production so if you want to see the show then start planning your holiday trip to New York! For the past 17 years the New York Transit Museum has presented a Holiday Train Show at the Museum's Grand Central Terminal Gallery Annex & Store. This year the festive display features Lionel trains traveling along a 34 foot long, two-level model train layout set against a backdrop designed by New York City-based artist Ebony Bolt. The trains depart from a miniature replica of Grand Central Terminal in New York and travel through the countryside on their way to the North Pole. Everyone loves trains so this exhibit is perfect for all ages! The theme of the holiday train show changes every year and the event is free and open to the public. If you don't mind heading out of midtown Manhattan, there's also a Holiday Train Show at the New York Botanical Gardens which features model trains zipping through a display of more than 175 New York City landmarks re-created with barks, leaves and other natural materials. This year's exhibition showcases Lower Manhattan - the birthplace of New York City. NYBG is located in the Bronx and is accessible by subway. One of the best things about being in New York City during the Christmas season is seeing the brilliant holiday window displays of the major department stores on 5th Avenue. Be sure to check out Bergdorf Goodman, Saks Fifth Avenue, Lord & Taylor, Macy's, Barneys, and Bloomingdales. Visiting Christmas markets in Europe has been high on my travel wish list for years but until such time as I'm able to travel to Europe in December, I satisfy myself by visiting European-style Christmas Markets in North America. If you enjoy these open-air markets as much as I do then you must visit the European-inspired Holiday Shops that are set up in the Bryant Park Winter Village behind the New York Public Library (between 40th and 42nd Streets & Fifth and Sixth Avenues). It's fun to browse the market's kiosks, try some of the delicious eats for sale and shop for the perfect gift for that special someone (or yourself!). If you're travelling with small children then be sure to ride the old-fashioned carousel while visiting the park. Whether or not The Nutcracker is part of your family's holiday tradition, you should consider taking in one of the New York City Ballet's performances of George Balanchine's The Nutcracker if you happen to be in New York during the holiday season. The magical ballet which includes a Christmas tree that grows to a height of 41 feet and weighs 1 ton is one of those experiences that you should have at least once in your lifetime. Performances are at The Lincoln Center on the Upper West Side beginning late November and running through until late December. The Metropolitan Museum of Art is one of my favourite museums in New York and when you visit during the holiday season you will be treated to a special exhibition. The Met has a longstanding holiday tradition of displaying a 20 foot tall blue spruce in the Medieval Sculpture Hall along with an 18th century Neapolitan Nativity scene that includes many exquisite crèche figures all set in front of a Spanish choir screen from the same time period. The tree is decorated with cherubs and angels and the figurines in the Nativity at the base of the tree include shepherds and their flocks and the three Magi as well as Neapolitan peasants and townspeople. Daily tree lighting events and Christmas music are also part of the elegant exhibit which is on display from late November through the first week of January.